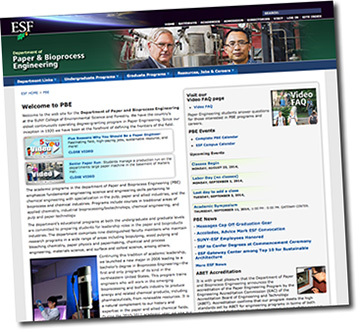 ESF's Department of Paper and Bioprocess Engineering received the Outstanding Commitment Award from Partners for Education and Business, Inc. (PEB). The award recognizes individuals and organizations who demonstrate outstanding commitment to the PEB mission and who have contributed to programs that advance the workforce needs of Central New York. PEB is engaged in providing career exploration and workforce development services for thousands of students in more than 100 companies in Central New York. The award recognized the commitment of the whole department, according to Dr. Gary Scott, department chair. He noted the effort was led by Associate Professor Biljana Bujanovic. Paper engineering students Joseph Piazza and AJ Murphy also assisted with the program. The collaboration between ESF and PEB began in 2010 when ESF faculty and students along with the Syracuse Pulp and Paper Foundation began hosting job shadow days for Onondaga County students interested in engineering careers. The department also participated in job fairs in high schools, at the Milton J. Rubenstein Museum Of Science and Technology and at Science, Technology, Engineering and Math Careers Day at National Grid. They have been active participants in promoting careers in paper engineering, bioprocess engineering and paper science through presentations with the Girl and Boy Scouts, Ed Smith Middle School, Cafe' Scientifique, the New York State Fair and the college's ESF in the High School program. The award was presented during PEB's annual awards program at The Palace Theatre in Eastwood May 29.